I am actually doing some paper and hybrid scrapbooking and I'm enamoured with the spraying, misting and masking I can do on paper. I wanted to recreate the same look for my digital layouts, so I designed Fuss Free: Masquerade 3 and Fuss Free: Masquerade 4, additional sets in the Masquerade series. The backgrounds are covered with lots of sprays and mists with circles masked out of the spray. Clip paper to these misted masks or simply recolor to add a unique hand-crafted look to your pages. Purchase Fuss Free: Masquerade 3 and receive Fuss Free: Masquerade 4 FREE. These sets are Fresh Fruit priced at 20% off ~ that's $3.60 for 8 templates. This offer is valid through January 17, 2013. 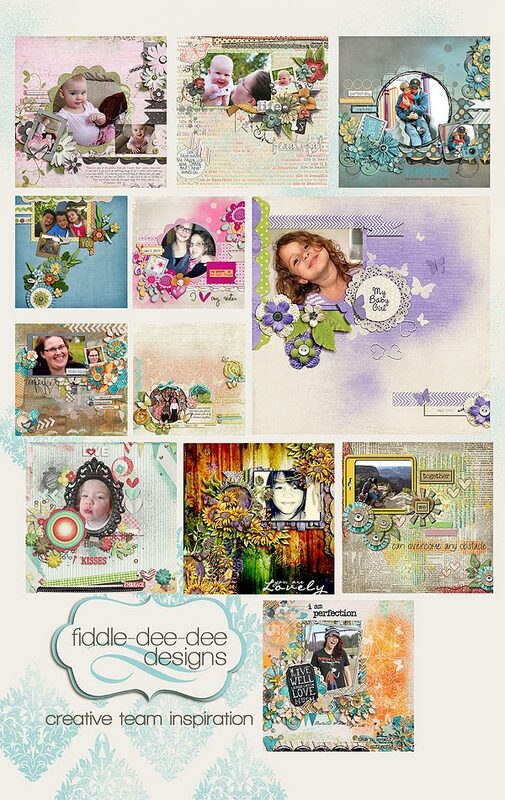 So glad you came by my blog today ~ please be sure to share all your gorgeous creations using my templates in the Fiddle-Dee-Dee Designs Gallery at Scrap Orchard or on my Facebook Fan Page.